Strewn garbage all over the roads is a common site in India. It is no different in Coimbatore despite the fact that the city has been selected for Smart City Mission initiative of Government of India. But one school decided to do something about it. 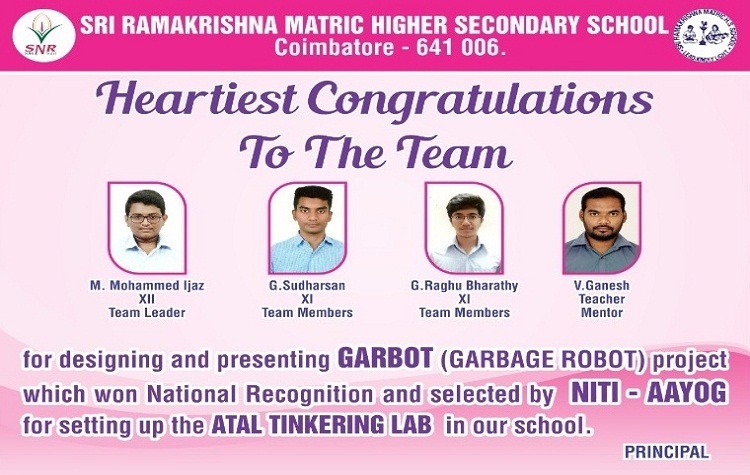 Principal R Ravi of Sri Ramakrishna Matriculation Higher Secondary School, Coimbatore, discussed the idea with his school teacher V Ganesh and three students M Mohammed Ijaz (student of class 12), G Sudarshan and G Raghu Bharathy (both class 11 students) and together they developed a ‘Garbage Robot – GARBOT’. The model has already fetched the school ATAL Tinkering Lab (ATL). GARBOT has been designed in such a way that it is capable of storing extra garbage (2 times the existing capacity) and preventing overflow of the dump. GARBOT works like this – by using electrical compressor which is in-built in the bin, garbage collected in it is compressed. This process is repeated till the bin reaches its maximum capacity. At this stage, the bin transfers the garbage to the nearby placed transportable bin (the two are connected through a conveyor belt). Once this transportable bin is completely full, it gets locked and a message is transmitted to the municipal corporation server. The sewage discharged during the compression process is collected in trays and treated. Also, the compressed waste gets segregated into biodegradable and non-biodegradable and is processed. All this is done automatically. With Swachh Bharat being the focus throughout India, the product is likely to be in demand not just in Coimbatore but all over the country.